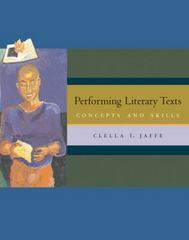 Performing Literary Texts 1 Edition PERFORMING LITERARY TEXTS (WITH INFOTRAC) gives you the skills and strategies you need for success in your oral interpretation course. Offering a performance-oriented approach, you'll see you to take into account the audience and the occasion as well as diversity and culture as it relates to performance, storytelling, and analysis. You'll also learn to cope with performance anxiety, Performing Literary Texts provides you with what you need to effectively perform and analyze literary texts for diverse audiences.